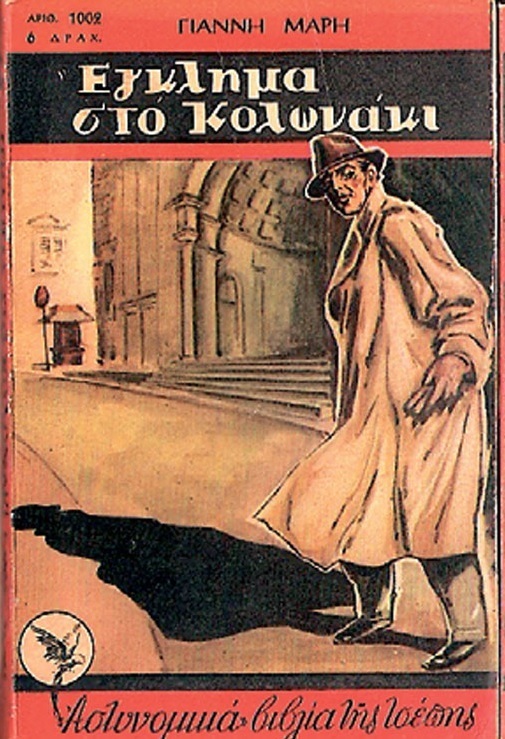 The first translated crime fiction series appeared between the 1910’s and the 1930’s. We have already mentioned the series of Nat Pinkerton adventures, published by Christofidis and Crhrisafidis in Istanbul from 1911 to 1913. The publication strategy of releasing a series of small and cheap booklets, typically 16- or 32-page long, was gradually adopted by several other publishers, including Mihalis Saliveros, Papadimitriou Brothers (Astir), Aristofanis Papadimitriou, Ioannis Skouteropoulos (Keravnos) and Dimitris Perantzakis (Heimmaros). One of the most serious attempts in this area was led by Mihalis Saliveros and Apostolos Magganaris as an “extension” of the first period of Mask magazine (1935–1938), with a series of 12 crime fiction novels titled “Modern Works”, including novels by Agatha Christie, Edgar Wallace, and other classic crime fiction authors (Kassis, 146). The flourishing of popular fiction lost its momentum during the 1940’s, when Greece was involved in a series of violent and traumatic events: the Second World War, the German Occupation and finally the Civil War. Information about the difficulties faced in this period by publishers, and everyone else working in the publishing industry, is scarce. In any case,the majority of the aforementioned publishers continued their activities during the 1940’s. In the 1950’s, after the end of the Civil War and the victory of the right-wing forces, Greece entered a period characterized by, firstly, a conservative ethnocentrism translated into political ideology, which informed everyday life; secondly, a turbulent but sustained economic development; lastly, a generally more welcoming attitude towards, practices, mentalities and forms of entertainment coming from the West, particularly the United States. The American influence became clear in all fields of popular culture, i.e. literature and the press, music and cinema. As part of this “Americanization”, the number of translations of crime fiction grew steadily in the 1950’s and blossomed during the 1960’s. As a result, these two decades represent a significant new period in the history of crime fiction in Greece: new publishers appeared, promoting a fresh approach; new technologies were adopted from abroad, and the overall quality of the publications improved. The 1950’s must be considered as a transitional decade because publishers were still hesitant, and still faced severe economic problems. Despite these obstacles, some began releasing crime fiction novels series as a central part of their catalogues. The longest and most important series of the decade was Astinomika Vivlia Tsepis Pechlivanidis (“Pechlivanidis Crime Fiction Pocket Books”). The publishers Pechlivanidis Brothers, borned in the Minor Asia's city of Antalgia, were already active in the industry before the Second World War. The three brothers created the Atlantis corporation during the 1940’s in Athens. In the following years, Atlantis became one of the pioneers in importing and translating US comic books for children and teenagers. Among their most successful titles featured were the famous American comics Classics Illustrated (1951– 1962); Laugh and Joy (1953–1963), a magazine with the children heroes of Disney comics, Warner Brothers, Metro Goldwyn Mayer etc. and The Best Comics (1961–1963), which consisted of superhero and science fiction comics, originally released by DC Comics and other major American companies (Kassis, 118-119, 134, 138-140). The characteristic element of the Pechlivanidis series was the use of red on its covers. The books were published on cheap paper and adopted a small size (11x17 cm). The series presented works by globally famous authors such as Agatha Christie and Georges Simenon, as well as less well-known writers., The translators were experienced professionals in the field of crime fiction, known for their work in magazines like Mask and Mystery, and some were authors themselves, as in the case of Jimmy Corinis (b. 1937) and Christos Hairopoulos (1909–1992). Moreover, an extremely important and actually ground-breaking move of the Pechlivanidis brothers was the inclusion of original works by Greek authors in their series, mainly the novels written by Giannis Maris (1916–1979). Maris (whose birth name was Giannis Tsirimokos) not only became the iconic writer of Greek detective novels of that era, but he is now considered as the “father” of Greek crime fiction. 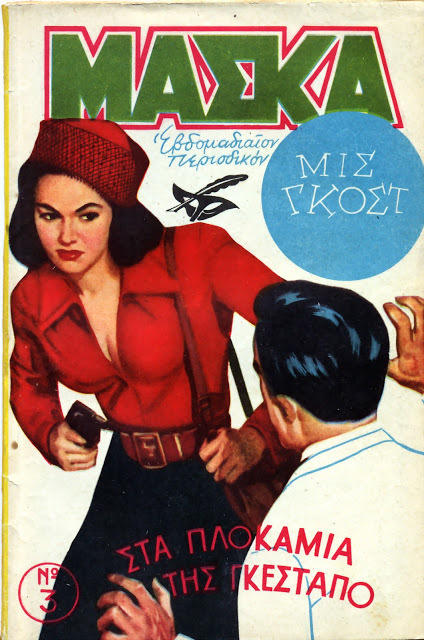 During the 1950’s, in parallel to foreign crime fiction, Greek crime fiction went through another crucial development. The integration of European and American influences matured and generated interesting literary results. Hence, the protagonist of most of Maris’ novels is Giorgos Mpekas, a Greek police officer who looks like a typical well-fed Greek family man of the 1950’s, but in fact is an ingenious solver of crimes. 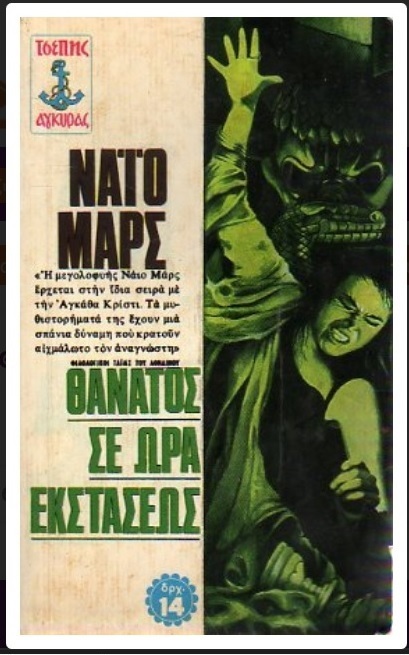 In 1947, another author, Nikos Marakis (1904–1973), began to publish the stories of Miss Ghost in Mask magazine, a beautiful and brave spy for the Greek guerrillas fighting the Nazis during the German Occupation. The adventures of Miss Ghost were extremely successful and continued until 1955 (Vlachos 01/05/2012). As is apparent, the work of these two authors was grounded in Greek history, society and the Greek mindset. Giannis Maris also became member of the editorial team of The Proton Detective Library, one of the most prominent series of translated crime fiction of the 1960’s a decade in which the genre flourished even more than before. Astinomiki Vivliothiki tou Protou (“The Proton Detective Library”), a magazine entirely devoted to crime fiction, was published between 1960 and 1969 by the Botsis Brothers, owners of the newspaper Apogevmatini (“The Evening Press”). At the time, the collaborators of this magazine were considered the elite of crime fiction writers and translators in Greece (Chanos IV, 149-150). In addition, a series of novels was released as an “extension” to the magazine, from 1966 or 1967 to 1969. These volumes had 32 pages and their size was 14x21 cm. The author who appeared most frequently in this series was William Irish, followed by Agatha Christie and Leslie Charteris (Kassis, 177). In 1960, the writer and publisher Tasos Lazaridis established one of the most important imprints of foreign crime fiction, the Lichnari ("Lamp") corporation. This firm’s key series was the Vivliothiki Astinomikis Logotehnias ("Library of Detective Literature"), which began in 1962 and still continues today, mainly with reprints of older volumes. These books are still found in kiosks and bookstores, where they are easily recognised by the yellow color of their covers and also their characteristic oblong shape (11x19 cm.). Most Greek readers identify the Lichnari series with the novels of Agatha Christie, but other recurring writers were Charles Exbrayat, Leslie Charteris, Peter Cheyney and Ian Fleming. As might be expected, it is very difficult to gain exact bibliographical data about this series because of the large number of reprints and the complicated numbering of the volumes. Due to the great success of its crime series, Lichnari expanded into other genres, such as science fiction (Koskinas, 01/11/2011). The success of crime fiction in the 1960’s attracted publishers who had been working with a wider range of genres and styles. For this reason, many literary series also started to include crime novels in their catalogue. The two most important were Galaxias: Vivliothiki Ellinon kai ksenon siggrafeon (“Galaxias: Library of Greek and Foreign Writers”) and Lohotehniki Vivliothiki Agkira (“The Literary Library of Agkira”). Galaxias publications was founded in 1960 by the journalist Eleni Vlachou (1911–1995) with the goal of providing pocket books endowed with the prestige of high literature. The "Library of Greek and Foreign Writers," therefore, embraced almost the entire spectrum of literature: from Niccolò Machiavelli’s The Prince translated by Nikos Kazantzakis (1961) and The Myth of Sisyphus by Albert Camus (1966) to the first novel by Ngaio Marsh, A Man Lay Dead and Robert Bloch’s Psycho, both released in 1960. The Galaxias series also included historical, geographic and philosophical books. Crime fiction had a leading role once more and writers as Agatha Christie and Ian Fleming proved to be most popular. In general, the goal of Eleni Vlachou was the same as with other publications of her company, all of which were addressed to a fairly educated and bourgeois readership open towards European culture. That is also the reason why Galaxia’s pocket books were designed to appear simple and elegant, and their covers did not feature any pictures. Also, this series continues nowadays mainly through reprints of old materials. Contrary to “Galaxias” publications, Agkira”(= “Ankara”) was an iconic post-war publishing company. Its creator and owner was Apollon Papadimitriou (1906–1968), a member of an important family of publishers who had long been active in the field of popular fiction. From 1935 onwards, Agkira was responsible for hundreds of pulp magazines, booklets devoted to fairy tales, and novels presenting original Greek works (Chanos, 41-44). Therefore it is not surprising, that Apollon Papadimitriou became interested in importing foreign crime fiction. At first, during the 1960’s, he included some novels in the series Literary Library of Agkira. The main translator of these novels was Giorgos Tsoukalas (1903–1974), a well-known author of popular fiction. In the early 1970’s a series exclusively dedicated to crime fiction made its first appearance. Tsepis Agkiras astinomika (“Agkira’s Pocket Books of Crime Fiction”) is still active today. The format of Agkyra series is typical of popular fiction: small volumes (12x19 cm.) printed on cheap paper and using colourful images, usually by Greek artists, on their covers. Finally, another imprint active during the late 1960’s was called Evropi (="Europe"), its very name indicates the publisher's attempt to bring a cosmopolitan flavour to its publications. It seems that the most frequently translated writer in this series was Ian Fleming. Unfortunately, the information available about "Evropi" publishing company is very limited. It is not surprising that the writers and the publishers showed a special interest for young readerships. Many new magazines and series of booklets for children and teenagers appeared in this period which specialised in a great variety of genres: spy fiction (“Little Hero”), jungle stories (“Gkaour Tarzan”), western tales (“Little Sheriff”), science fiction adventures (“Superman”) and, of course, crime fiction. One representative fictional detective of this era is John Greek, created by Nikos Routsos (1904–1984), one of the most versatile authors in Greek popular culture. The adventures of John Greek started as a successful radio show (1956–1958) and continued as a booklet series, irregularly released from 1958 to 1964. John Greek was a tough private detective of Greek origin living and working in New York City. 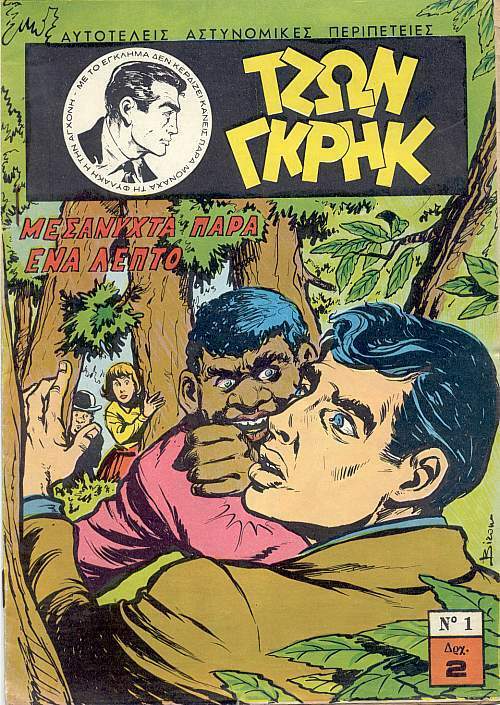 This series was an attempt to adapt the noir genre for the Greek young readers (Vlachos, 2011). “Little Hero” was another famous magazine of this period. Released from 1953 to 1968 it reached the remarkable amount of 798 weekly issues. In this series, writer, publisher and journalist Stelios Anemodouras (1917–2000) wrote of the exploits of a gang of young people that took part in the Greek guerrilla effort against the Nazis and their allies during the German Occupation. 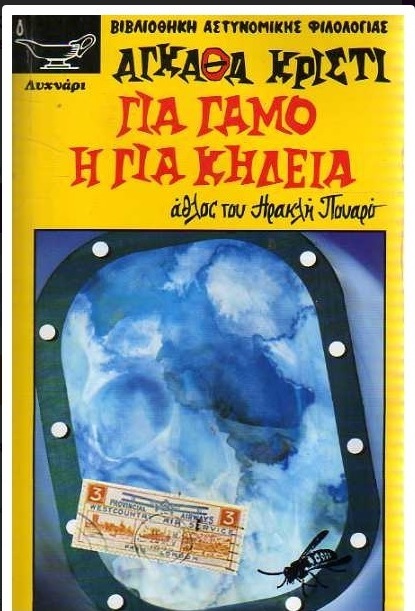 The existing information on the active years of this series is contradictory: according to the online catalogue of the Greek National Library, the earliest extant copy of Pechlivanidis Crime Fiction Pocket Books with an exact year of publishing is volume 1016 and it was published in 1950 [“Oi 6 pethamenoi” (“The 6 dead men”) by Belgian Author Stanislas Steeman]. On the other hand, the latest copy is volume 1123 and it was published in 1961 [I ora tis moiras (“The time of fate”) by Agatha Christie]. 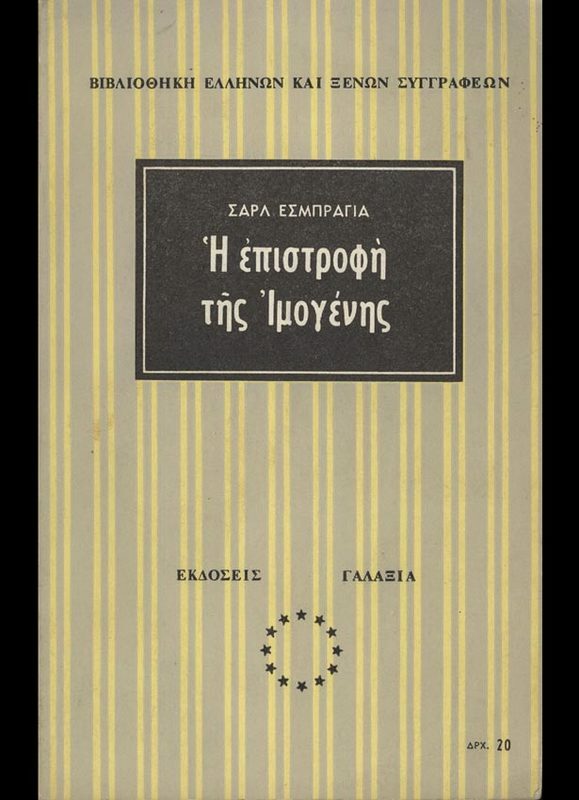 However, another source inform us that Giannis Maris’ novel “Crime in Kolonaki” was published in 1955, as volume 1002 (Maris, 1). Finally, according to the National Library, the last extant volume is number 1125, but we do not know the exact year of publication, possibly 1960 [To pio frihto egklima (“The most vicious crime”) by Ursula Curtiss]. According to this contradictory evidence, the Pechlivanidis series was active from the late 1940’s to the early 1960’s. We have to note that we were unable to find the original titles of the aforementioned novels, with the exception of “The Six Dead Men”, which is an exact translation of the original. This hero is a Greek creation by Stelios Anemodouras, who is better known for the “Little Hero” magazine. Anemodouras was influenced not only by Superman but also chiefly by his competitor Captain Marvel. (Kassis, 196-197). The surname of Tsiforos’ fictional spy is a pun, since “firiki” is a Greek word for a variety of apples.